The rusted red telephone box in Lowick Green created a strikingly sad image to those who passed by the rural South Lakeland Village. 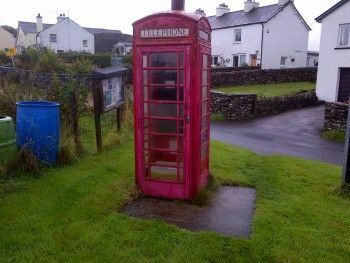 However, the disused booth has now been given a new lease of life as villagers have used funding to transform the once iconic British symbol into a useful community asset. The Lowick Green Management Group was awarded £750 from Evening Hill Grassroots Grants to carry out the refurbishment. The phone box is now back to its original stunning scarlet colour and is used as a local information point. A noticeboard has been installed and bus timetables and other items of local information have been placed in the phone box. Daily newspapers are delivered to the box, as it is used by the village as an informal newspaper drop-off point. People can also shelter in the booth while waiting for the local bus service. 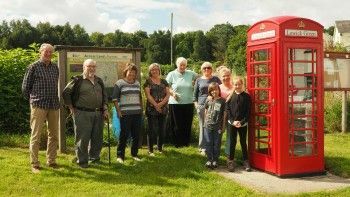 Richard Ellwood, Chairman for Lowick Green Management Group, said: “We are delighted with the recent improvements to our village phone box which have enhanced the pride we have in our local area. “The phone box is a local landmark. Prior to its restoration, it was becoming an eyesore which gave the impression that our village was neglected. This is not the case and it is reassuring to know that visitors to the village will see the care we take with our community spaces.